Entering into the spirit of Ed Thomas’ populist adaptation of the Brecht masterpiece, here is today’s Merthyr Express front page headline: Bassey Impressionist Trolleyed in Labour Club. National Theatre Wales’ loves showing “stuff” on video screens as part of their productions. So the TV guide would maybe read: “Mother Courage: Loose Women meets Stella meets Skint meets The Valleys”. What has any of this got to do with Mother Courage and Her Children? You may well ask. Such analogies are fair game in this show that took the remarkable story of a woman’s struggle for her own and her children’s survival during war and placed it in a Valleys’ karaoke and disco Saturday night. Yet they add as little to our understanding of Brecht’s work as the transposition of this production. To be fair, the idea of plonking the tale into working class Valleys was clear in a cliché sort of way. All we needed was a tattoo parlour and drugs – but then we had those in Welsh National Opera’s Llanelli-based post-industrial steel town opera Gair ar Gnawd. Less clear, well totally unclear, was the finale of this, yawn, promenade performance that ended up outside the building where whatever the actors were saying or doing was drowned out by the noise of Merthyr traffic. But first with the praise – and where that applause was unreservedly deserved – the marvellous cast of Donna Edwards, Sara McGaughey, Gaynor Morgan-Rees, Rhian Morgan, Sharon Morgan, Cathy Owen, Nicola Reynolds, Ri Richards and Eiry Thomas. There is no disputing that the all-female cast playing female as well as male characters – soldiers, the cook and padre and the two sons – was outstandingly impressive for the quality of the acting (any other reason for the gender choices is still lost on me). Rhian Morgan was a truly breathtakingly sensation as Mother Courage who held the entire evening together and it was only when we could not focus on her (i.e. the outdoors part) that the show, the passion, the empathy was subsumed into engine noise and car headlights. Her singing, spoken word, physical acting were all-consuming and while the overdone swearing distracted from some of the performances, such was the intensity of this Mother Courage, the boorish and often boring expletives flowed into a gut-wrenching lyricism. Donna Edwards was continuously entertaining and captivating as the bitter prostitute (I’m avoiding tart with the heart) who has been forced into her degrading situation that is masked by over-the-top bravado by men and war. Her comedic performance was great fun, if at times masking the scarred interior of this victim. The splendid Sharon Morgan has no words in the play yet gave a gruelling, throat-grabbing performance as the daughter who Mother Courage desperately tries to protect. Eiry Thomas and Cathy Owen played the sons Eilif and Swiss Cheese and, while I was not convinced by McGrath’s intellectual central conceit of having women portraying them, Eiry Thomas in particular was utterly convincing as an insecure lad easily seduced into the false glamour of the military such was her well-crafted mannerism and gestures. Nicola Reynolds was a full-on, macho fuelled soldier, but it did cross my mind that she could have also been playing up to a stereotype of lesbians in the military as much as a cannon-fodder male squaddie. Ri Richards as the Chaplain, Sara McGaughey as the Cook and Gaynor Morgan Rees who had three smaller yet crucial roles, completed the toweringly talented ensemble. While there were easy bible-bashing Welsh minister stereotypes for Ri Richards and the directing team to drill into, the Cook didn’t seem to have any great Valleys’ relevance not parallels for Ed Thomas to incorporate. So beyond accent it didn’t really move beyond the Brecht drawing of another damaged soul corrupted by circumstance, floundering in the filth of war, capitalism and an ugly humanity. Dramatically, the evening started well with the Labour Club laid out like a normal social club entertainment evening with rows of trestle like tables and chairs with the actors mingling with the crowd. The idea of using linked up shopping trolleys to form Mother Courage’s wagon from which she makes a living selling to the soldiers started off as a clever idea. With John McGrath’s direction, all continued well enough. The way in which the songs that form an integral part of the work were presented in karaoke style with lyrics on the screens fitted in fine with the social club setting. Dafydd James’ score seemed to be drawn from the melodies and associations of well-known songs, socialist ditties and Welsh tunes. So we have songs that sound like I Will Survive, for example, and Sospan Fach and, from what I think I could hear, The Internationale. Maybe that was due to a mixture of the Merthyr traffic and my imagination. I half expected the 1812 Overture at one stage. Even the over-used convention of planted audience members joining in singing didn’t jar too much. After the interval the show started falling apart as the tables were taken out and we were left wandering around a disco (cue the community participants again) and eventually the story continued. 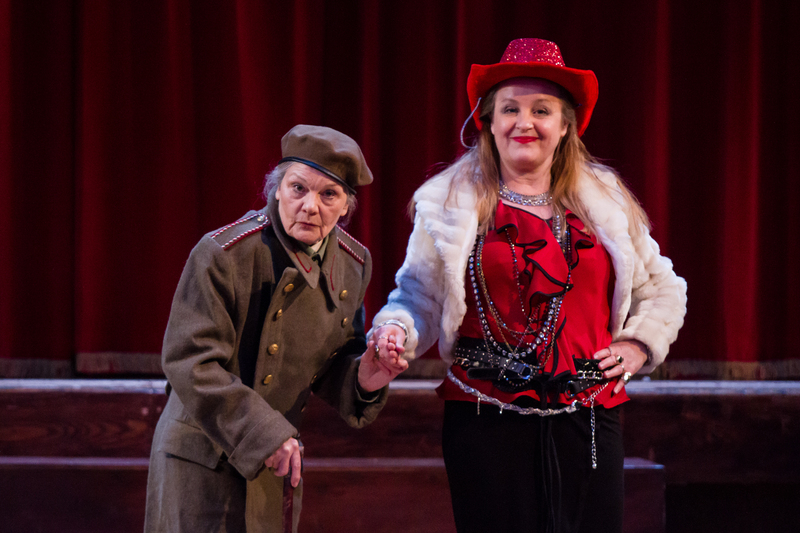 This is where we get the Bassey big hitter type contribution from Mother Courage in her swooshed-up hair and glittering dress, while Yvette, the soldiers’ whore reappeared as someone who had come into money. So this Valleys’ girl swapped her red cowboy hat and red boots for a posh frock. You get the idea. I did mention the MTV programme Valleys, didn’t I? By now those shopping trolleys had become plain annoying (can I suggest asking Eddie Ladd, Gwyn Emberton and Deborah Light to come and sort it out as their ‘Caitlin’ was a masterful way of using shopping trolleys as props. For some reason in this second half we also abandoned meaningless 30 Years War chronology on the screen and instead had virtually every action documented. Why? By the way can someone remind directors about sightlines? Just as the audience worked out they could sit on the floor or in our case a radiator giving a slightly surreal angle on the events, what did we have but another over-used gimmick of a fire alarm, meaning we all had to traipse outside. Okay so above the awkward chit-chat as we were kettled into a crowd (again sight lines?) and got used (ish) to the traffic noise, the play came to its denouement which seemed to involve the surviving child climbing scaffolding and banging on something while all sorts of something happened in the car park. The child was shot, bells ring and Mother Courage wandered out the car park with her trolley. It was actually reasonably clear the child was warning a town that the enemy was approaching but that is about it. I doubt if many people unfamiliar with the play knew what was going on but that didn’t stop the enthusiastic applause, of course. But I was so tempted to ask people as they left to tell me what they had just seen. In some ways the NTW raison d’etre of taking theatre out of traditional venues into less conventional spaces that served it well in its first year has since proved something of an albatross as there are perhaps more misses than hits. At the same time dynamic new companies with minimal resources are grabbing audience and critical attention as the cult of the new moves on. Back to Brecht, despite reservations about the gimmickry the show is worth the ticket price and travel to Merthyr because of those precise, passionate, polished, powerful performances.